I have a confession to make. Until today, I have never successfully poached an egg. It’s crazy, I know! I mean, egg-poaching is a very basic cooking skill and I feel so ashamed that until now, it has completely flummoxed me. About a year or so ago, I was bound and determined to learn the proper technique, only to end up with a pot of what looked like egg-drop soup. I tried again and again; and again and again, I failed. I was told my eggs were too fresh. Then I was told that maybe they weren’t fresh enough! And then, this week I happened upon a little article in Real Simple Magazine about the many uses of a meat thermometer that just happened to mention that the ideal temperature for poaching eggs was 180 degrees fahrenheit! Eureka! That was the variable I never considered in my earlier attempts. I knew that the water should be barely simmering, but I never thought to check the temperature. Well, that’s what I did, and SUCCESS! Beautiful, silky, decadent, perfectly-poached eggs! I feel like a winner now and if you’ve ever had trouble with poaching eggs, I encourage you to try one more time and check that one little variable: temperature! Not too long ago, I had a similar dish at a nice restaurant in town that serves brunch on the weekends. They called it a “farmer’s market breakfast” and it was $14! 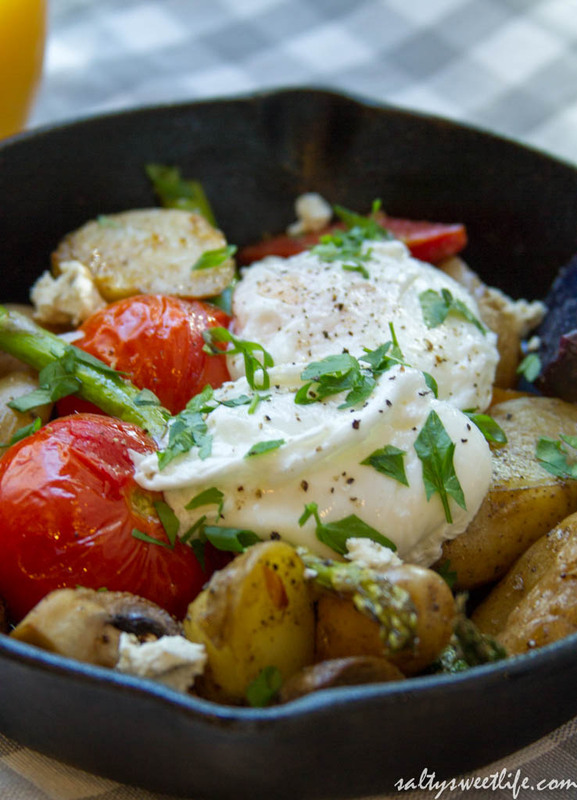 Simple and rustic, it was beautiful combination of roasted fresh vegetables, creamy goat cheese and those amazing poached eggs. 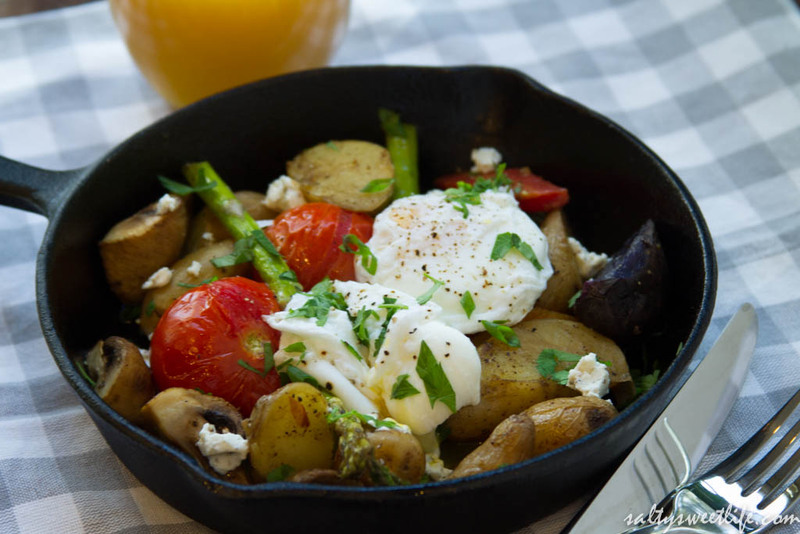 In replicating this restaurant dish, I used a combination of fingerling potatoes, asparagus, tomatoes, carrots and mushrooms. 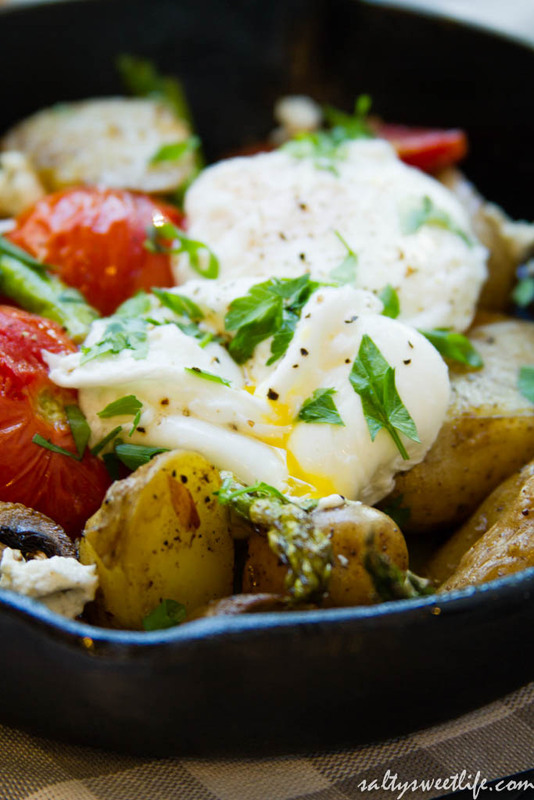 It’s perfect for a weekend brunch as it takes a little extra time; but, if you’ve prepared the fingerling potatoes beforehand, the dish comes together very quickly. This recipe is very flexible. I have included approximate amounts for two people, but you can make as many vegetables as you wish for each person. Plan on two poached eggs per person. Poach the eggs during the time that the vegetables are roasting and keep them in a bowl of hot water until you are ready to serve them. I learned how to make perfect fingerling potatoes from my friend, Alexandra from the blog, Alexandra’s Kitchen and I have been making potatoes this way ever since! It is truly the easiest and best way to make well seasoned potatoes that are not at all mushy or overcooked. You might balk a bit with the amount of salt called for in the recipe, but I promise you, the potatoes will not be over salted! 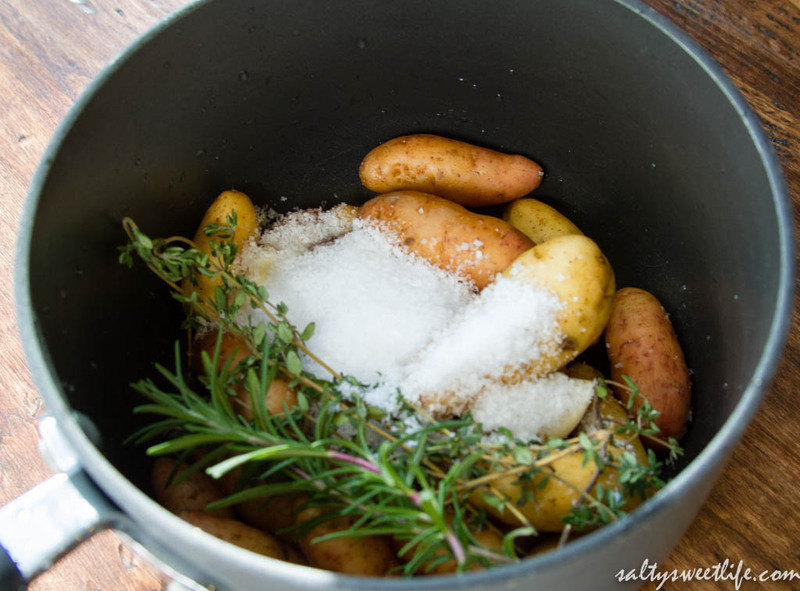 Simply place the fingerling potatoes (about a pound or so) in a saucepan with a heaping quarter cup of kosher salt, 3 cloves of smashed garlic, a few sprigs of fresh rosemary and thyme and enough water to cover the potatoes by about 2 inches. Bring the pot to a boil, then turn off the flame and cover the pot. When the potatoes have cooled, they are done! Simply drain them and slice them in half for this recipe. Store any leftovers in a sealed container and use throughout the week! 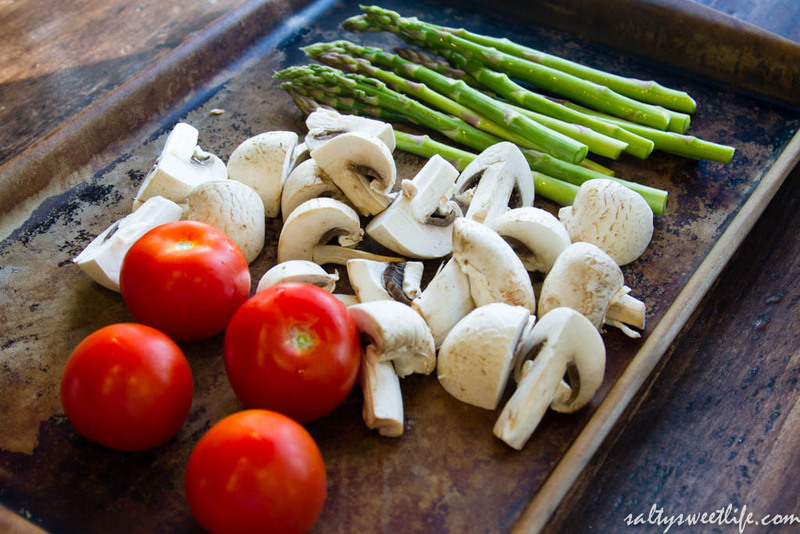 Place all of the vegetables on a baking sheet and drizzle with olive oil and toss to coat. Season the vegetables with a generous pinch of salt and a few grinds of black pepper. 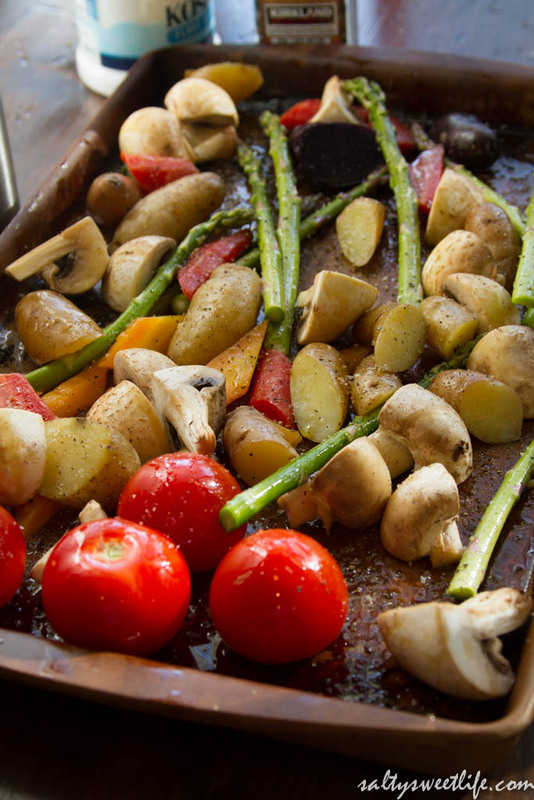 Place the vegetables in the 450 degree oven and roast the vegetables for 20-25 minutes. Fill a medium saucepan with the water one tablespoon of apple cider vinegar. Bring the pot up to a slow boil, then lower the heat until the water is barely simmering. Use a meat thermometer to check that the temperature has reached 180 degrees. Fill a medium sized mixing bowl with very hot tap water. Break an egg into a small cup or ramekin. When the water is steady at 180 degrees, take a spoon and gently stir the water in a clockwise direction. Pour the egg from the ramekin into the center of the swirling water. The swirling water will gather the egg whites around the yolk. Now set a timer for exactly two minutes. After two minutes, gently lift the egg from the water with a slotted spoon and place it into the bowl of hot water. Repeat this method with each egg. When the vegetables have finished roasting, check the seasoning and add additional salt and pepper if needed. Toss the vegetables with the lemon juice and sprinkle with crumbled goat cheese. Place a portion onto each plate and top with two well-drained eggs. Sprinkle the eggs with salt and pepper and then garnish with the parsley and green onion. Those eggs are perfect! You should really call yourself an underground restaurant and start charging people for brunch. Haha! Thank you! Can you believe it’s taken me this long to learn how to poach eggs? Embarrassing! Lovely tomatoes as usual. The combination of tomatoes and all the vegetables must have given your kitchen a wonderful aroma. The fresh herbs definitely worth my sense of smell. Great recipe. 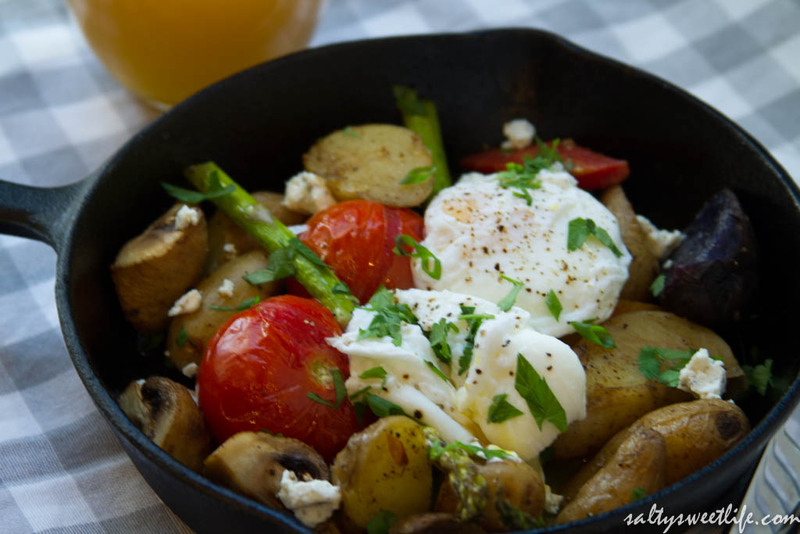 This is my favorite weekend breakfast–eggs dragged through the garden!